On Cozy, you can connect your bank account using your online bank login or by manually entering your bank details. Before we start sending payments from that bank account, we need to make sure that you're the account holder! If you link your bank account to Cozy using your online bank login, it'll be automatically verified. We don't support logins for all banks right now, so you might need to enter in your account and routing number to link your account. When you enter a new bank account, we'll send two small deposits (both less than $1), to your bank account within 1-3 business days. Note: These deposits that we send temporarily are Cozy's money and about a week later will be pulled back. Make sure you have enough money in your bank account or you might overdraft! Note: You only have 10 attempts to verify, so entering random guesses will lead to a lockout. If you're sure you're entering the right amounts, and it's still not working, email support@cozy.co. Tip: Any scheduled payments that are pending due to the bank verification process will start processing shortly after you verify your bank account. It's been 3 business days- where are the deposits? If you only see one deposit, contact your bank to help locate them. Sometimes banks combine amounts this small. 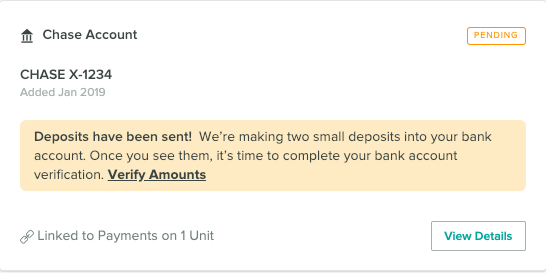 If you see a "Deposits failed" message, this means that we couldn't locate a bank account using the details you entered. Try re-adding your bank account and we'll resend the small deposits. If it's been over a week since you connected your bank account, we've probably pulled the deposits back since these were temporary. Try checking your bank account around the time you entered your account details as your bank should still have a record of what was deposited.